You are currently browsing the category archive for the ‘R3 Bags’ category. I fell in love with the idea of plarn crochet on the day before Earth Day this year. Now, I must come to terms with the fact that the pain in my hand, wrist and forearm are largely due to this plastic affair. Crocheting with yarn doesn’t hurt (unless I’m doing it for hours on end). Crocheting with plarn does, and for the past few days, the pain has extended to driving (turning the key and handling the steering wheel), typing (even on my ergonomic keyboard), using the mouse, writing, and – today – turning door knobs. I have said good-bye to plarn. Honestly, I prefer crocheting with yarn. It’s not as hard on the hands, and I don’t have to cut it up first. But I like the idea of plarn. I like that it was different, and that the designs I was brainstorming and developing were different than any other plarn bags I’ve seen online. As Mom reminded me today, however, one does not need to be doing something entirely unique to be a successful artist. One merely has to do what one does very well. I’m holding onto the grocery bags I’ve been given and been saving. I may play with the idea of fusing. Mom and I had some brainstorms about that today. We’ll see what comes of it. Jason has convinced me to take a week off of any type of crocheting (waaah! ), and I’m going to be limiting my computer time as well, to give my hand/arm time to heal. In the meantime, we’re going to move an armed desk chair* down here, as I never had a problem with my mouse use when I had my elbow resting on the arm of a chair. *That would be a chair with arms. Not one armed with a weapon. The latter is somewhat against my pacifist nature and probably wouldn’t help much with the pain. In browsing blogs and Ravelry last night, I was inspired by several bread bag projects I came across. Jason was up late working (again), so I grabbed some bread bags from my already-been-washed pile so I could stay up and keep him company without falling asleep. (I also have a to-be-washed pile of bread bags, and a hanger over the washing machine with washed ones that were drip dried there. We’re in plastic overload here.) I decided to go for something small, and a wristlet was the first thing that came to mind. I had it about 75% crocheted last night, and I finished it up this morning. Not content to wait until the thrift shops were open to find the perfect fabric for lining, I cut up an old t-shirt I never liked anyway and hit the fabric & button stashes. Et voila! *With apologies to Ms. Neuwirth for the pun. I simply can’t resist sometimes. 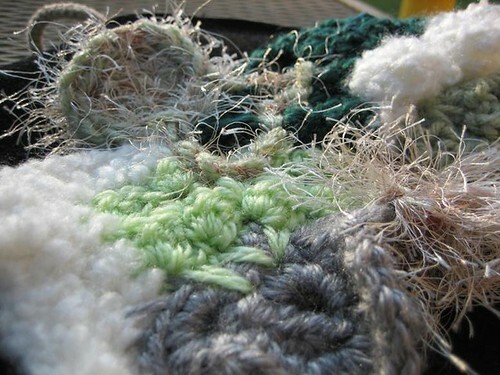 So, I’ve seen a few examples of scrumbling online, which I can only interpret as kind of a crazy quilt sort of crochet technique. 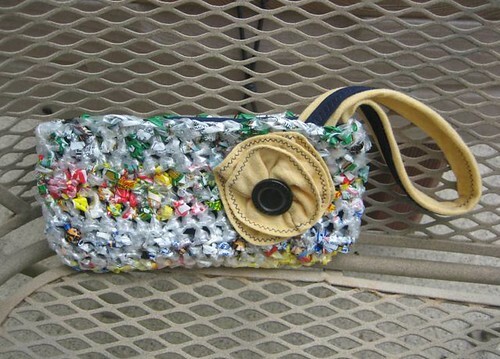 I love the idea and decided to try it for one of the purses I got at Goodwill. In keeping with the recycled theme, I’m using only leftover bits of yarn from other projects. I wasn’t sure at first how I liked it, but I think it’s going to be interesting. Any thoughts? I know – three posts in one day after a month-long drought? What happened? Remember that whole cyclical-life thing I talked about earlier this summer? I sort of cycled out of creativity altogether for a few weeks there. A lot of stuff going on…in other words, life. Well, wow. That’s pretty cool. And then today I was approached out of the blue about another creative opportunity, combining two things I love to do. I have to leave that as a tease for now, but if you want to do a little happy dance to celebrate with me anyway, feel free! I was happy dancing all afternoon. And, all of a sudden, I’m fired up again! I’ve felt sort of in limbo since school has been back in session. When I took my leave of absence (in April) from the store where I worked evenings for three-and-a-half years, it was with the understanding that I’d come back during school hours when Kalen started Kindergarten. I sort of had the feeling as August approached, though, that my availability (10am-2pm) wouldn’t quite mesh with the store’s needs, especially taking the current economy’s effect on retail into consideration. I spoke to my manager last week, and she wanted to mull it over…to play with the hours a bit to see if it could work. That in itself is a compliment. She could have just said no outright. I talked to her Monday, however, and it is a no-go. I’m okay with this. The income would have been nice and would have helped pound out the debt faster, but we’re fine. And now that I know, I’m at total peace. I have excitedly thrown myself at the feet of my children’s teachers, offering to do whatever they need me to, I’m going to start volunteering at the media center at school, I’m writing for my ongoing gig, and I can start designing and crocheting for my etsy shop. I am going to miss the closet design aspect of the retail job quite a bit, but bag design should fill my creative needs, don’t you think? I don’t believe I can accurately convey my thankfulness that I have the opportunity to stay home with my financial contribution being so little. Many thanks to my husband for working so hard, and to both of us for sticking to our total money makeover. All off this finally brings me back to what my original purpose for clicking “New Post” was. I’m finally going to sit down tomorrow and design a bag for my shop. You heard it here first! After the last couple of heavy-duty posts, I thought I’d lighten things up a bit around here. Look at the yummy yarn I bought today at Goodwill! What? You don’t see yarn? I do! These sweaters have been officially dubbed yarn-to-be. 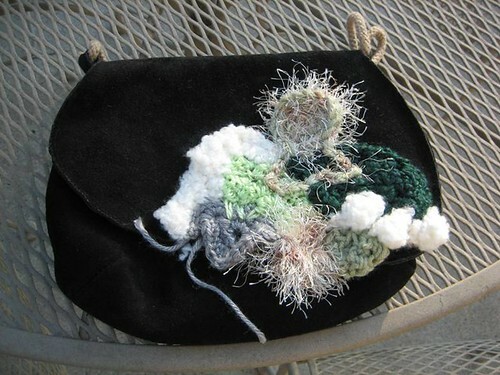 I have read and re-read several tutorials on reclaiming yarn, and I want to give it a go. 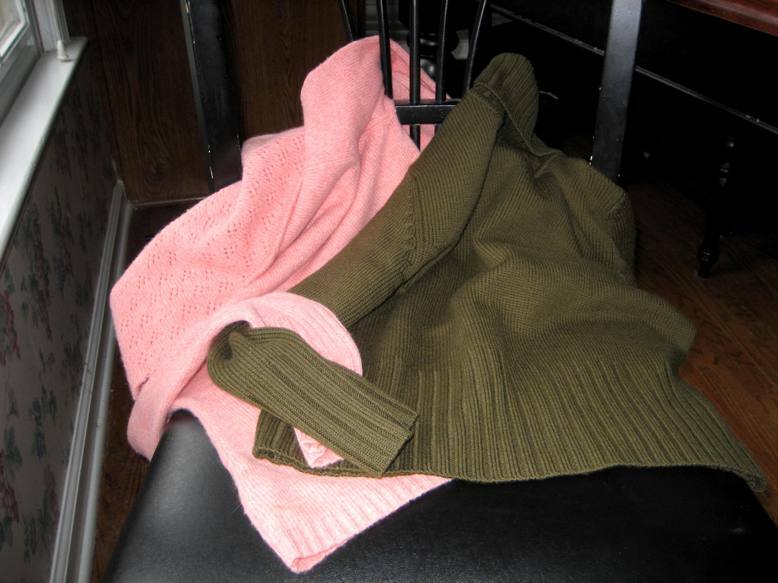 I spent about twenty minutes this morning combing the racks at Goodwill and actually found four or five sweaters that would have worked. 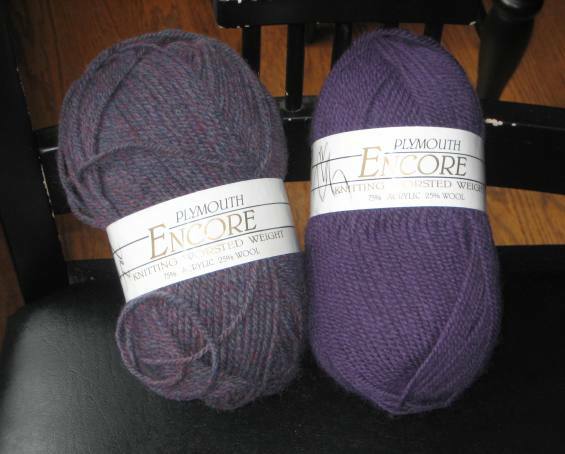 My budget’s limited, however, even at $4 per sweater, so I narrowed it down to these two. 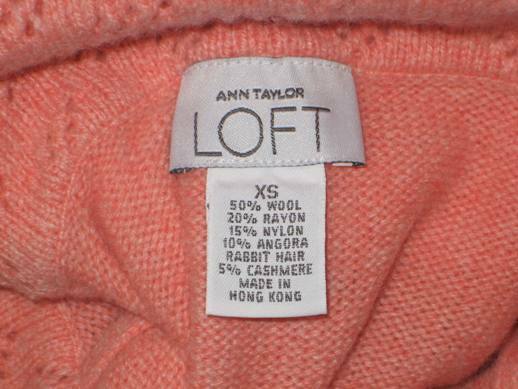 The green is a beautiful 100% Italian Merino Wool, and the salmon is an intriguing blend. Here, I’ll let the label speak for itself. I’m not a huge fan of the salmon color, but I figure this is a great opportunity to practice my yet-to-be-developed dyeing skills. Since it’s 65% animal fiber, it should hold some Kool Aid dye. If nothing else, an over-dye may have an interesting mottled effect. I plan to do a little color calculating first, though…I don’t want to end up with mud. If I learn the yarn-reclaiming process well and think it’s something I can do well, I may consider selling it in my new etsy shop. I’m not set up yet…I need to get some purses and bags made before I jump in. (What’s a shop without inventory, after all?) I do, however, have a name for it now: R3 bags. (The 3 should be superscript – anyone know how I can do that on blogger?) The three R’s are [tentatively] Reuse, Reclaim, Repurpose. While I predict that most of what’s up there will be bags, I’m not closing my mind to the idea of offering reclaimed yarns, and maybe even plarn. I’ve found that a lot of people do one plarn bag, then never touch the stuff again, simply because of the labor involved in cutting the plarn. Obviously, this is still all in the very beginning stages, but in a week or two I’ll be able to devote more time to it. I also need to get Photoshop Elements installed on my new computer, because not having a logo finalized is driving me nuts.